The name Pietie Coetzee is synonymous with World Hockey, it is synonymous with South African hockey and it is synonymous with class. For years South Africa have had the unfair advantage on being able to call on the lethal finisher into squads that have punched well above their weight. Over the time that she represented South Africa she was a luxury item and her value will only truly be realised now that she is no longer available for us. So good was Pietie Coetzee throughout her career that she was one of the most instantly recognised South African sports stars off the field, even though she played one of the lowest profile sports on the field. Television coverage of her was at a minimum for a lot of her career, but pride from South Africans was never as such. Instead where the name of Pietie Coetzee went you were bound to find pride in tons that she was one of our own. The 35-year-old is arguably South Africa’s greatest sports star post isolation and would comfortably deserve mention alongside the likes of Hezekial Sepeng, Victor Matfield and Jacques Kallis in a discussion of greats. Her career stats are almost unthinkable and are unmatched anywhere in the world. She represented South Africa in 287 test matches and in those matches put away 282 goals, including one in her final game that led South Africa to a 9th placed finish at the FIH Hockey World Cup. She retires with the World Record in her hands for most International goals, a record she overtook in 2011 with a hat-trick against United States in the Champions Challenge. 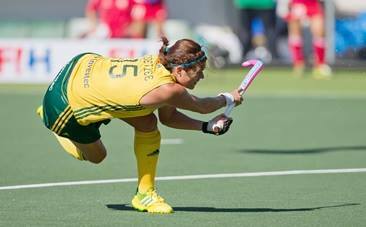 Coetzee represented South Africa in three Olympic Games (Sydney 2000, Athens 2004 and London 2012) as well as at two FIH Hockey World Cups (Delhi 2010 and Hague 2014). Although South Africa will not see her on the International stage any longer, Pietie will continue giving back as she travels the country conducting her Pietie Coetzee Hockey Clinics for lucky students who hope to emulate her someday. She may no longer represent South Africa on the global stage, but she is still a hero of the blog and of course of mine! Pietie, we thank you for your commitment to South African sport. We thank you for the moments of sublime inspiration and we thank you for being proudly South African. All of us at All Things Jabu would like to wish you all the best for your retirement!